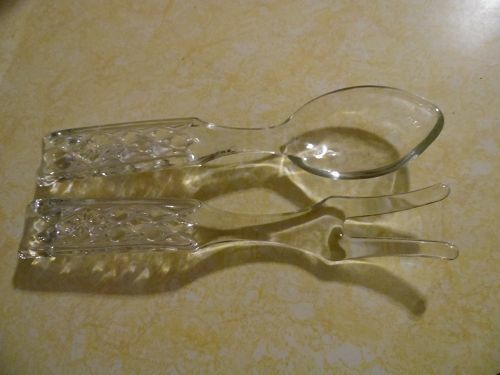 Vintage Fostoria Large Solid Quilted Glass Salad Servers Serving Spoon and Fork. 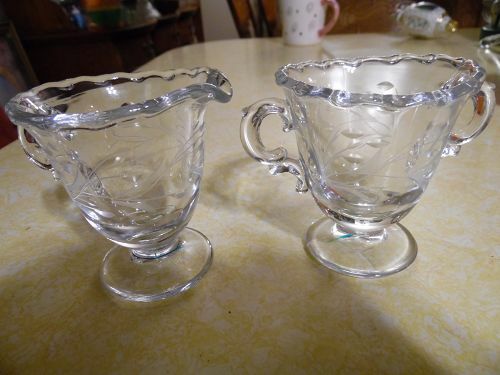 Handles are similar t the Anchor Hocking Wexford pattern. 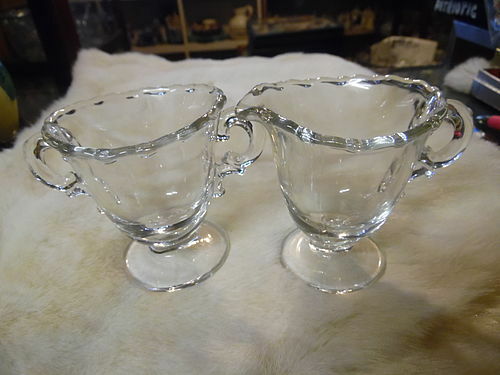 Measures 9.75" and are in excellent condition. 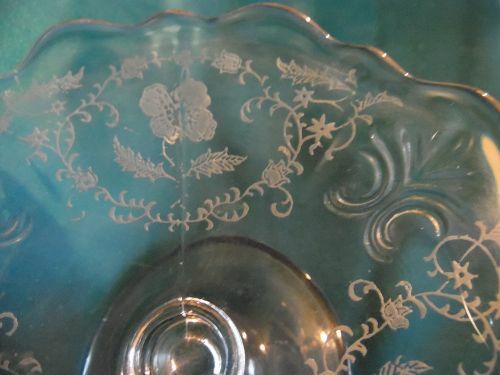 Beautiful Azure blue flared bowl in the Baroque pattern made by Fostoria. 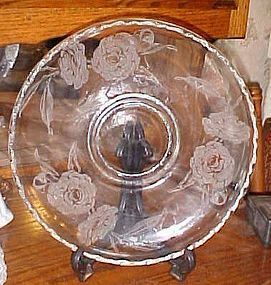 1937-1943 Sometimes Fostoria would etch these pieces and sometimes they are left blank. No chips or cracks. It measures 11" X 3 1/4" TALL. So beautiful!! 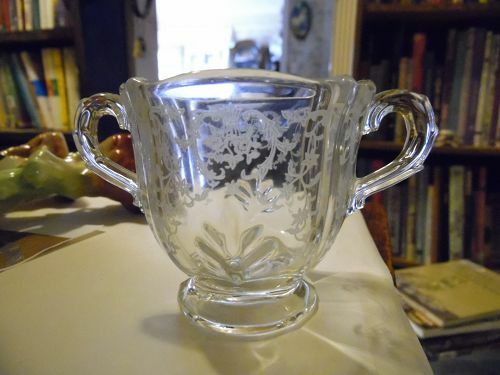 Lovely Fostoria open sugar bowl. Coronet blank #2560 with the pretty Willomere #333 etching. Prisine condition. 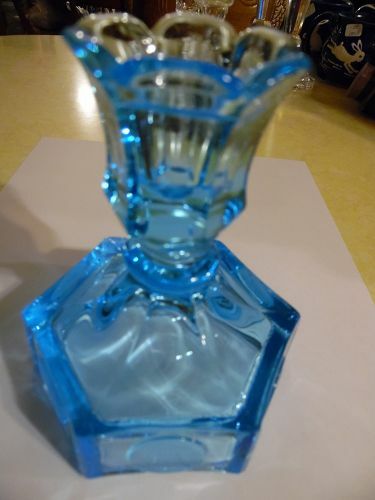 Measures 3" tall. Made from 1938-1970. 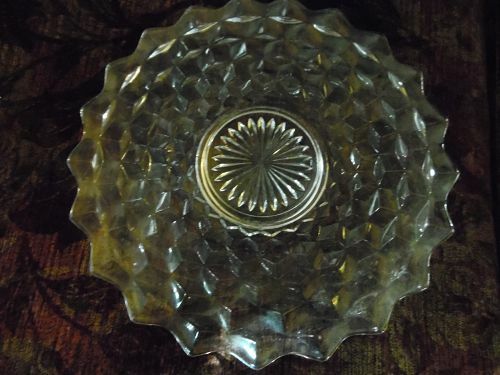 Fostoria american 12" round platter serving plate with small center. Condition is excellent . 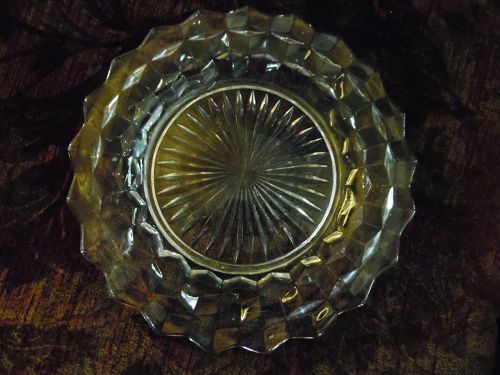 Fostoria american 9 1/4" dinner plates with large center. I have 2 available. Condition is excellent on both. 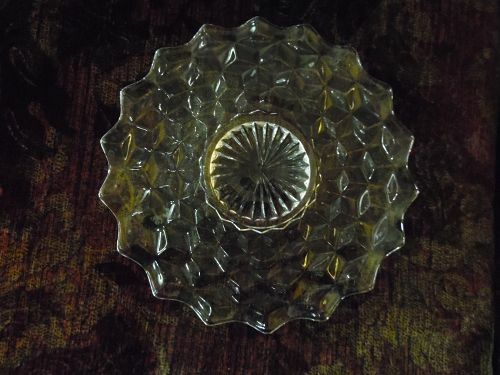 Fostoria american 7 3/4" salad plates with small center. I have 2 available. Condition is excellent on both. 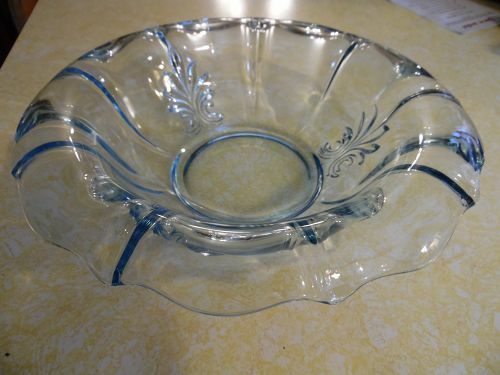 Fostoria Camellia pattern lily float console bowl 11 3/8"
Beautiful lily float bowl or center bowl in Fostoria's etched Camellia pattern. Bowl is 11 3/8" wide and 2 1/4" deep. Perfect condition with no damages of any kind. 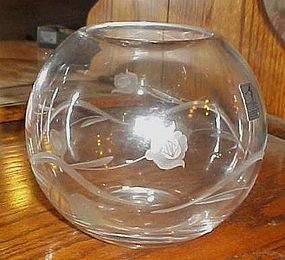 Beautiful Fostoria heavy crystal round ball vase measures 6 1/2" tall. Perfect for roses or ivy. Original sticker, made in Romania. Nice cutting of flowing vine with rose pattern. Ground top edges and in pristine condition. Would make a lovely impressive gift. 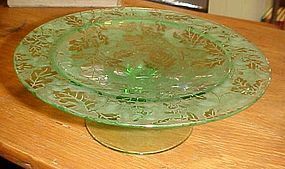 desireable oak leaf pattern green comport made bt Fostoria. Made from 1928 - 1931.All over oak leaf and acorns brocade. 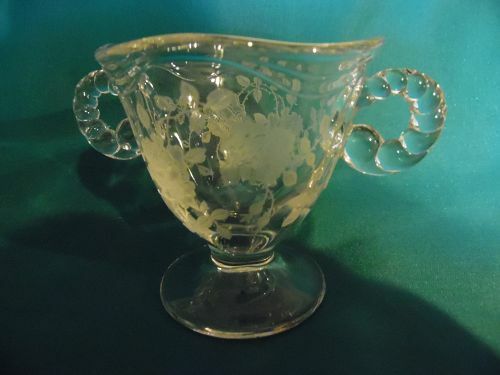 Measures 2 3/4" tall and shallow bowl area has a diameter of 8 3/8". Perect with no cracks or chips. 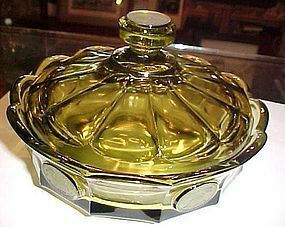 This vintage green glass Fostoria Coin glass ash tray is very heavy. Four coins in the center on the underside. 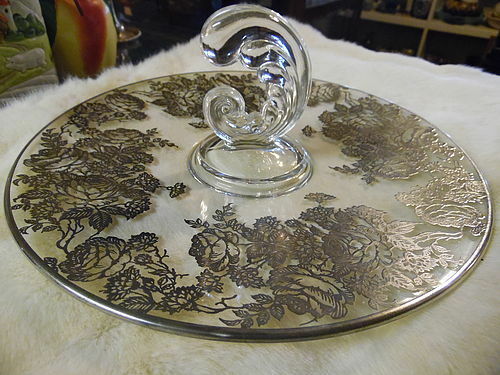 Beautiful condition other than a sliver chip on top side on the edge of one of the cigarette rests. This ashtray is almost 8" by 1".White area in photo is a sticker residue. Chip is almost impossible to see in the photo. This ashtray boxed and shipped is over 4 lbs. 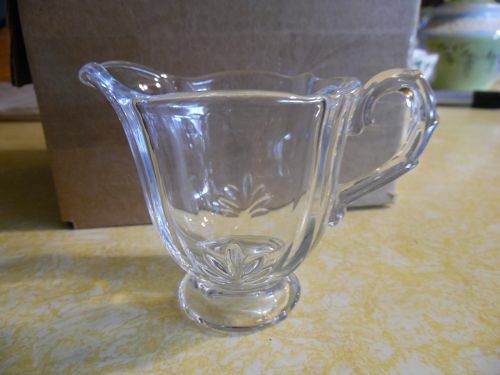 Absolutely beautiful vintage Covered Candy Dish, or powder jar made by The Fostoria Glass Co. 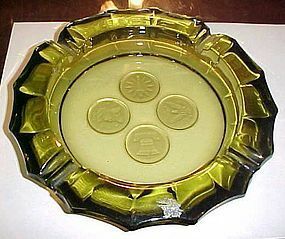 The pattern is coin glass. The color is a lovely olive green with frosted coins of different kinds. It is a heavy dish and is in excellent condition with no chips or damages. Perfect to add to any collection! The dish measures approx. 6-1/2" in diameter and is 2-1/8" tall without the lid and 4" tall with the lid. It has 6 coins on the dish and 1 on top of the lid.